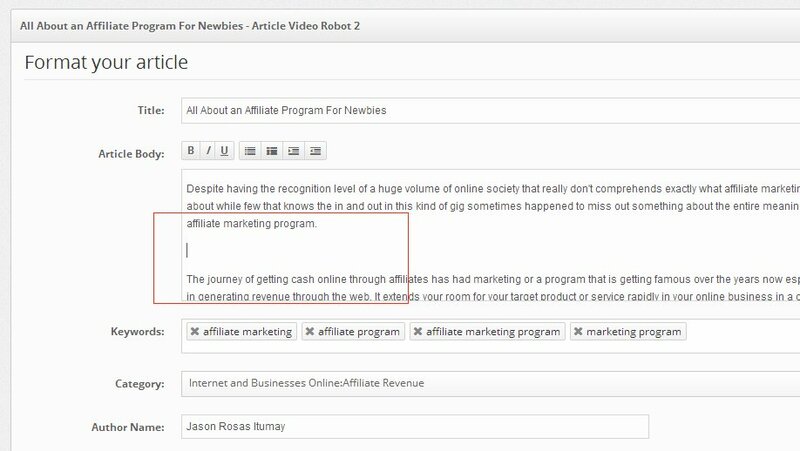 A properly formatted article body makes it easy for Article Video Robot to analyze your text and break it into relevant frames and items resulting in better output videos. This tells our wizard that you want to break a particular frame here. Apart from this AVR takes into account various factors like length of each frame, item in each frames, etc. to decide the best possible format for your video. a) I Have sort of divided my artiice into a number of limited word sentences with each frame representing each sentence, however the system does'nt recognise this and keeps telling me to divide my article up? images from MSWord to the article page on AVP the images did not show? Is it possible you could raise this as a support ticket? As for the information regarding splitting frames, if you could let me the project (by raising a support ticket), I can have it checked. Did you upload the images manually into each of the slide? Note that AVR may not detect a straight copy paste from Word if you copy the images the paste it into AVR. If that's the case, then you'd have to manually save the images and upload it to the individual sites. *) but I do not get to the next page as shown in the manual?? Clearly there are 6 steps before being able to publish, unfortunately I cannot get to even the next step?? Thank you for the detailed reply. As Navneet had contacted you via email, this is being looked at through the regular support process.